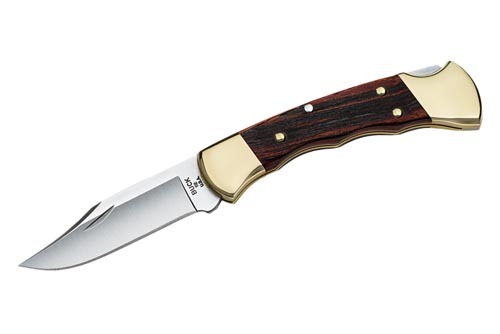 Ranger Folding Knife Finger Grooves: Overview Classic, reliable tool. Smaller version of the 110 Folding Hunter®. Easy opening and closing with the nail notch and lockback design. Length 4 1/4" closed. Made in the USA Blade Shape: Clip Blade Length: 3" (7.6 cm) Weight: 5.6 oz. (159.4 g) Handle: Dymondwood Carry System: Sheath Origin: Made in the USA Blade: Satin Finish, 420HC Stainless Steel Handle: Macassar Ebony Dymondwood, Finger Grooved Carry System: Genuine Leather Sheath, Black Available Features and Options 420HC Steel This is Buck's standard blade material because it approaches the wear resistance of high carbon alloys while delivering the corrosion resistance of chromium stainless steels. Add our exclusive heat-treat process and you have a very user-friendly combination of superior corrosion resistance with excellent strength for wear resistance and durability. You also have a blade that is easy to resharpen. For best performance we harden to a Rockwell hardness of Rc 58. Clip The crescent tip makes the blade thinner with a sharper point. This shape provides good control for detail work and cutting in tight places. It is also well suited for intentional punctures like new holes in your belt, etc. While the point of the blade is effective for detail work, it's not as strong as the thicker points on drop points and skinners.